This Ergonomic, Adjustable, Comfortable, Detachable and Breathable VR SHINECON 3D VR Headset with Built-in Stereo Headphone, makes your daily life more cool and more sense of Technology. The HD Aspheric lens provides a 100° FOV turning your smartphone into an ultimate 3D machine for your private 3D cinema. More than 500 virtual reality apps on Apple App Store and Google Play Store for you download to enjoy shocking 3D effect. 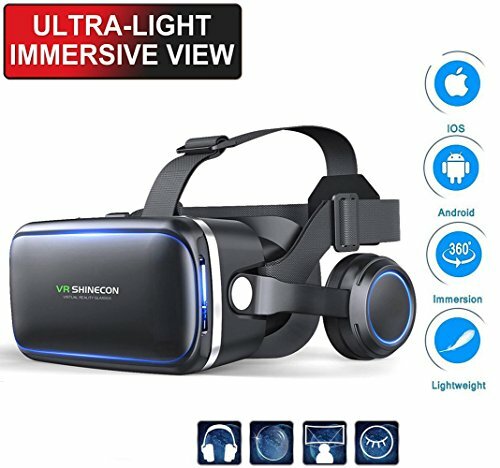 This VR SHINECON 3D VR Headset is widely compatible with iPhone, Samsung and Other 4.7-6.0 inches Smartphones, such as iPhone X / iPhone 8 / 8 Plus iPhone 7 / 7 Plus iPhone 6S / 6S Plus iPhone 6 / 6 Plus iPhone 5S / 5, Samsung Galaxy Note 7 / Note 6 / Note 5 / Note 4 / Note 3 / Edge S7 / S6 / Galaxy S9 / S8 / S7 / S6 / S5, LG K8 / K7 / G6 / G5 / G4 / G3 / V20 / V10, SONY Xperia Z, HTC One Max / Desire 816 / One M9, ASUS Zenfone 2, Huawei, Nexus, etc. ★Remember change to split-screen mode before inserting, then put your phone rightly into the viewing frame. The higher resolution, the better experience. ★If you wear your myopia glasses, you need to first put your myopia glass in the headset first. Because of the adjustable PD and FD, you can use it without glasses to prevent to damaging the blue ray lens and protect your eyesight better. ★The best way to use this VR SHINECON 3D VR Headset is to make yourself backward 45 degrees when watching. ★If there's phenomenon of fuzziness and double images, please adjust the 2 PD adjustment switches at the top of the device. ★The iPhone X / 8 / 8+ / 7+ need a 3.5mm convert plug when connect your iPhone. LATEST VERSION OF VR -- We are the source factory of VR SHINECON. After two years of research, development and adjustment, we not only reduce the volume and weight , but also pay more attention to internal component. We are constantly conquering various barriers to obtain the most accurate fitting of parts. PROTECTS ALL SMARTPHONES! -- The soft sponge on the inside of Our VR SHINECON Headset protects your screen or phone case from getting scratched!Use peace of mind. FAST & EASY FOCUS LENSES!! -- You can focus easily with the turn of a dial that adjusts to your natural eyesight QUICK. Protecting you by removing any eye strain that causes pain! EYES PROTECTING&COMFORTABLE -- HD resin aspherical lens are updated to be more smooth and purified. It can completely eliminate the feel of vertigo and provide you high-resolution imaging and the color visual event. It has soft and breathable leather padding keeps you feeling good even after hours watching. COMPATIBLE WITH all the 4.7"-6.0" Smartphones -- Such as iPhone 5/SE/6/6s/7/7plus; Samsung Note8, S5, S6, S6 edge, S7,S7 edge; Google Pixel, LG, Huawei, HTC, Nexus, SONY, etc. If you have any questions about this product by VR SHINECON, contact us by completing and submitting the form below. If you are looking for a specif part number, please include it with your message.